The 201 chassis went through two front headlight changes. From 1984 to 1986 the U.S. version had rectangular sealed beam headlights surrounded by a headlight door with a yellow fog light lens cover. From 1987 to 1993 the headlight (as shown above) looked very similar to the 124 headlight with the fog light lens cover being clear plastic. The Mercedes 190 Class was one of the most successful Mercedes designs since the chassis was able to uphold the Mercedes image and still appeal to all generations and middle class pocketbooks. 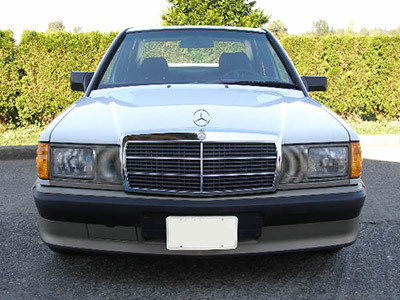 When first introduced in 1983 it was also the test bed for the all new suspension slated for the new W124 E class. This chassis was only produced as a 4 door sedan and it was fitted with both 4 and 5 cylinder diesel and 4 and 6 cylinder gasoline engines. It has been commonly named the baby Benz.